The public, private and nonprofit sectors are abuzz with the concept of the triple bottom line: the belief that success is not measured solely through profit, but also by the well-being of the people and the planet. The public sector has long recognized the synergy between economics and ecological sustainability. For example, according to the San Francisco Department of the Environment, San Francisco has achieved an 80 percent waste diversion rate through a Zero Waste initiative. This initiative saves on landfill costs and is self-funded by the revenue generated through selling recycled materials and compost. Unfortunately, the public sector has struggled with the link between social well-being and environmental sustainability. Communities have developed a range of policies, in an effort to help consumers make more environmentally-friendly choices and promote sustainable lifestyles. However, these efforts fail to address the social inequities inherent in energy production that supports our habits. These policies essentially treat the symptoms and not the enabling forces. Life depends on resources: air, water, food and energy. But when resources are scarce, those with the most power enjoy the benefits, while those without power bear the heaviest costs. Herein lies the source of environmental degradation: those who bear the costs of our carbon emissions and resource consumption have no say in how resources are produced and allocated. Those who wield the power over energy choices are not the ones experiencing elevated cancer rates and respiratory problems due to power plant emissions. We can continue squandering resources to feed our inexhaustible consumption. However those who have to live among the technology waste have little say in regulating the health of their environment. The health impact of our consumption on disadvantaged communities is staggering. 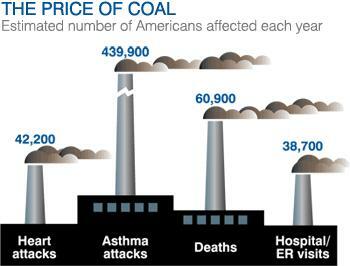 Consider just one source of carbon emissions: coal power. According to the U.S. Energy Information Center, coal power comprises a whopping 39 percent of electricity production in the United States. The Clean Air Task Force estimates that approximately 7,500 deaths per year can be attributed to contaminants released in plant emissions. And who is it that is paying for our consumption with their health? In the 2011 report “Coal Blooded: Putting Profits Before People in Illinois,” Adrian Wilson notes that people residing in the communities within three miles of the top 12 dirtiest coal plants have an average per capita income of $14,626 (compared with the U.S. average of $21,587) and 76.3 percent of the residents are people of color. It is intolerable that we consider any death an acceptable price in exchange for maintaining the status quo. It is clear that this is allowed to continue because those determining our energy policies are not those paying the costs with their lives. Social inequity and conditions contributing to climate change can seem limitless and intractable when viewed globally, but every community grapples with social inequity and environmental hazard. The key to achieving an environmentally healthy and socially just planet begins and ends in communities just like yours. And that’s where we, as public administrators, have a big role to play in addressing climate change. By recognizing that all three components of the triple bottom line are critical to success, it is imperative to promote social equity as a path to sustainability, not just a happy consequence. 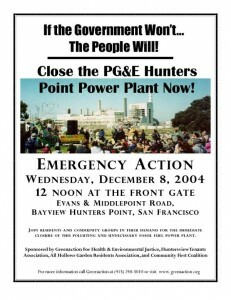 The closing of the Hunters Point power plant in San Francisco is a great example of the universal benefits that can be reaped when those with the least power and the most burden have a seat at the table when economic and environmental decisions are made. 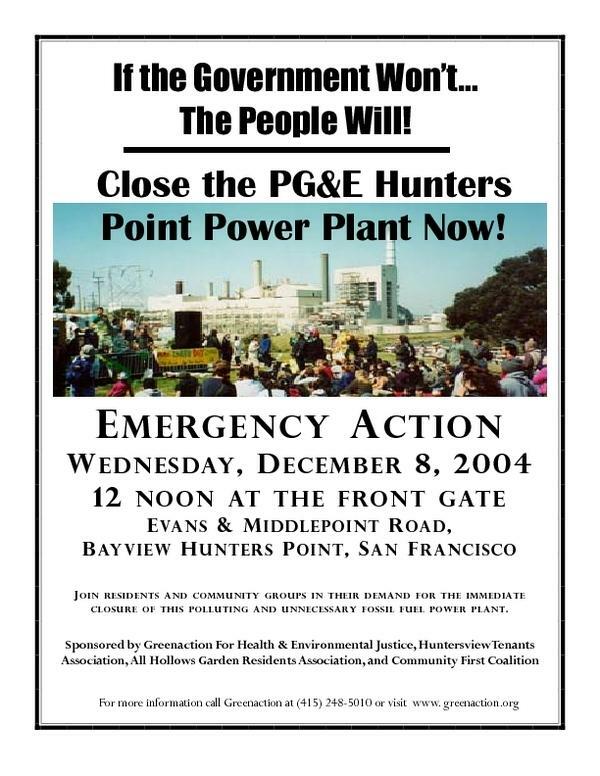 In 2003, Pacific Gas and Electric Company (PG&E) was finalizing plans to shut down the Hunters Point power plant, located in a community with a disproportionate number of people of color. It was a great victory for a community that had long experienced elevated health risks attributed to the plant emissions. However, PG&E planned to replace the plant with four new natural gas “peakers,” plants designed to come online as peak demand required. Community activists, already mobilized in the fight against the existing plant, were able to capitalize on their organization to influence members of the board of supervisors, eventually bringing Mayor Gavin Newsom on board to shut down PG&E’s plans. The plants were replaced by a transmission line bringing power from East Bay sources, including renewable power sources. In the fight against climate change, it is essential to implement programs to change consumer behaviors. But by ignoring the social inequity that is sowed in supporting our way of life, we are ignoring a powerful tool in combating environmental degradation. There are opportunities to fight for social equality and sustainable living in every community through inclusion of impacted communities in the decision-making process. Once this power is leveraged nationally and globally, we truly have a chance to save the planet from environmental degradation. Author: Kate Voshell is a licensed architect specializing in the design of affordable housing. She is currently pursuing her master of public administration in sustainable management at Presidio Graduate School.